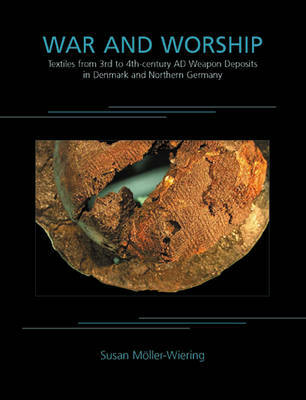 War and Worship concerns textile deposits from the bog sites of Thorsberg in Germany and Nydam, Vimose and Illerup Adal in Denmark. All four sites are well-known for containing a substantial amount of archaeological materials, particularly weapons, but they also contain, as integral parts of the weapon deposits, a smaller number of preserved textiles, which nevertheless constitute outstanding assemblages. With the exception of Thorsberg, publications dealing particularly with textiles from weapon deposits are almost non-existent. The textiles from each site are analysed, then compared to one another and described as a unit characterising the particular site. Comparisons are then made between the four sites, with emphasis on the overall context. A final chapter by Lise Raeder Knudsen analyses tablet-woven textiles in the deposits, a textile technique used to make bands, edges and borders. Although the state of preservation of the textiles at the different locations varies hugely, the research has extracted a large amount of information allowing conclusions on status, origin, function and role in the deposits to be drawn. The fabrics presented here were, unquestionably, consecrated textiles. They had been worn by the defeated foreign warriors during the battle and were considered worthy as sacrificial offerings to the gods. Some individual high-status textiles were perceived to have a value comparable to certain metal items. Others - probably the majority - were used for covering and wrapping other offerings for the subsequent sacrifice. All were committed to the lakes in a sacred act of remembrance to celebrate victorious battles.